Near the Georgia border, but in North Carolina. Attempted on March 11, 2008. How to get there: This mountain is located south of Rainbow Springs, a small village along Hwy. 64. Hwy. 64 runs east-west in North Carolina, just north of the (south) border to Georgia. In order to reach Hwy. 64, one can travel south along Hwy. 68 from Interstate 75 (south-west of Knoxville), or take Hwy. 23 south-west from Interstate 40 (near Asheville). From the south (Atlanta) one may drive Hwy. 19 north from (freeway) 285, then take Hwy. 76 followed by Hwy. 69 to Hayesville. Measure from the intersection between Hwy. 69 and Hwy. 64, just south of Hayesville. Drive approximately 18 miles (29 km) east on Hwy. 64. Look for a brown sign on your right saying Forest Road 71. Take this (dirt) road as it turns a bit back and runs somewhat downhill. After about 1 mile (1.6 km), this road forks and the left fork, which is the correct way, may be closed by a gate. If the road is open, continue driving to a place called Deep Gap where there is parking. If the road is closed, park without blocking any road/access and hike along this road to Deep Gap (see below). An alternate trailhead is located at the Standing Indian Campground. In order to get there, first continue east on Hwy. 64 from the Forest Road 71 turnoff for another 3 miles (4.8 km), then turn right on Old Hwy. 64 and drive about one mile (1.6 km), before forking right and continue about 3 more miles (4.8 km) in order to reach the campground. The road forks here, take the left branch and continue a short distance to an obvious parking area. This is the trailhead, location N35:03.870, W082:46.577, elevation 1071 meter. A, along Forest Road 71: From the road fork, follow this road uphill to the first major col in the ridge located at N35:03.717, W083:33.802, elevation 1303 meter. Another road goes left here, there are also two old forest roads that link in here. Continue on the main road taking the right fork. The road now runs on the left side of a sloping hill. Hopefully, you will get to Deep Gap where you should locate the Appalacian trail that will take you further onwards to the summit. The distance from Deep Gap to the summit (one way) is supposed to be 2.4 miles (3.9 km), while the distance from the road fork to Deep Gap may be around 4 miles (6.4 km), but along an easy road. 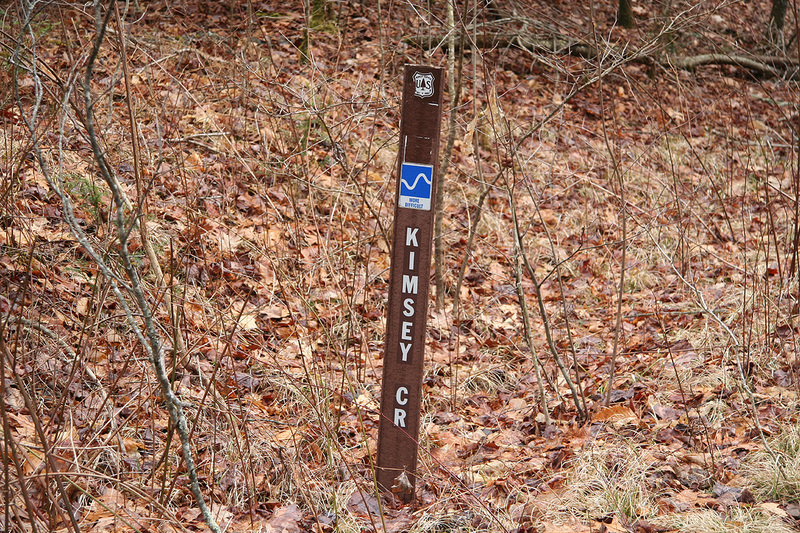 B, along Kimsey Creek Trail: From the trailhead, proceed slightly downhill following blue markers, to the (other) paved road. Turn left and cross the river. Immediately on the other side, the trail leaves the road going right. Proceed a short stretch downstream, then more left before arriving at a trail junction. This place is well marked with a big sign. 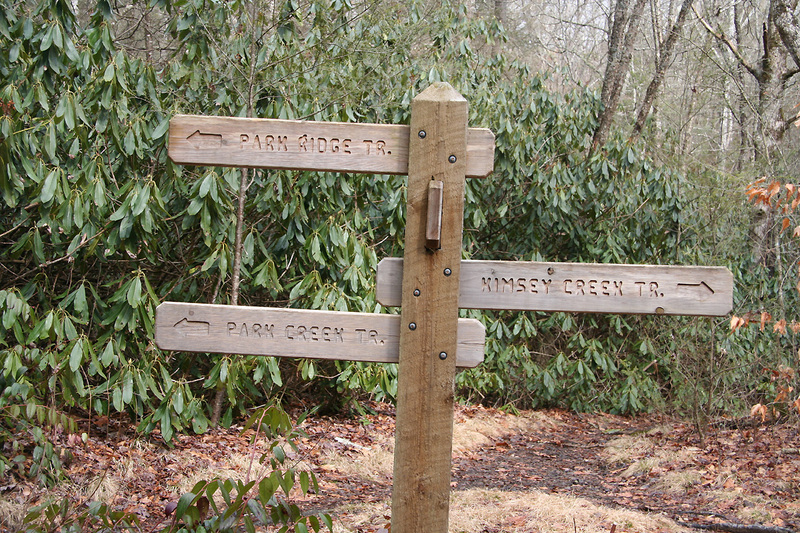 Turn left and follow the Kimsey Creek Trail. This trail is also marked with blue paint. The trail soon climbs a hill then contours left and joins an old road. Soon thereafter, you emerge in a more open field and your trail runs upstream on the right hand side of a medium sized creek. Almost immediately, you will arrive at a point where the trail is marked with a double blue marker, the standard sign for extra attention. 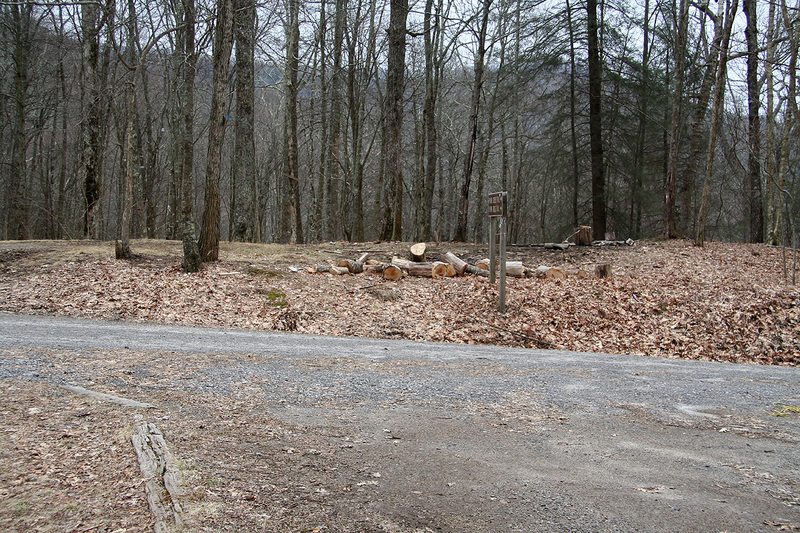 A clearly marked blue trail leaves the old road and goes right, a beam of wood (to keep dry) can also be seen. DO NOT TAKE THIS TRAIL. The path that continues straight ahead, does not have any blue markers that can easily be seen. In fact, it appears that it will just end as it hits the creek. Despite of this, proceed towards the creek and you will again find a blue trail marker as well as a bridge that crosses the creek. It is assumed that the rest of the trail can be followed to the place where it merges with the Appalancian Trail in Deep Gap, then follow this (2.4 miles) to the summit. However, in light of the experience reported below, there could be more problems, so bring a map. The total hike may be about 6 miles (10 km) one way. Comments: This trip shows how a (wrong) decision followed by a poorly marked trail can lead you completely astray. It also may serve as a strong reminder on how useful it is to have a current map along, even on hikes that appear to be straightforward. I first located Forest Road 71, turned right onto it and drove it to where it forks only to discover that it was closed at this point. I strongly considered to park my car and proceed along the remainder of this road on foot. However, my route description read: "Follow this Service Road #71 for several winding miles until you come to Deep Gap parking area." I had a long drive to Atlanta after this hike and wondered about the precise interpretation of "several winding miles". Would this be 4 or 9 say? This would certainly make a difference, since I knew of an alternate trail that was approximately 3.7 miles long (to Deep Gap). I finally decided to minimize risk and drive onwards in order to find this alternate trailhead. This was relatively easy and I parked my car at the Standing Indian Campground around 1245. The place had an encouraging sign informing hikers that local bears were harassing hikers and that they showed no fear of humans. I quickly located the main trail and followed blue markers to a major (3-way) trail intersection. This place had a big sign informing about the various trails and their respective names. I was supposed to follow Kimsey Creek Trail, it headed left, while the other trails continued right. My trail was still marked with blue paint on the trees. It partially followed old logging roads, partially ran its own course. I quickly noticed that whenever the trail made a sharp turn or entered/left such a logging road, there would be two blue rectangles on a nearby tree as opposed to the normal marking with a single blue rectangle. This as a sign for special attention to route finding where one could otherwise easily continue along a wrong (unmarked) path. I walked by an old gate towards a medium sized creek (Kimsey Creek? ), when again the trail was marked with two parallel blue rectangles. Sure enough, the well marked trail branched right and continued across some sort of wooden beam put in place to keep people's feet dry. The trail continued and again joined an old road before reaching a gap where several old logging roads converged. The only blue marked trail now continued up and along a ridge. Things looked pretty promising as I could see what looked like a major break in the ridge up front. It made sense that this should be Deep Gap. I had walked (very) fast and looking at my description, it read: "After about 3.7 miles (6 km), you will come to a very obvious gravel road and an open field that is used to collect timber." Everything looked good until I became aware of a sign that read Park Ridge Trail / Park Creek Trail. This seemed to be the same trail names as those that had pointed 180 degrees opposite of Kimsey Creek tail. No sign of directions to Kimsey Creek Trail or Deep Gap for that matter. This looked rather mysterious, but I immediately sensed that I might be in the wrong location, despite the pretty good match with the description of finding "an obvious gravel road". My description said that I should proceed "through this area" and locate the Deep Gap as well as the main Appalacian Trail a short distance beyond. It started raining, just to make the circumstances even more delightful. In order to keep a good speed, I had my running shoes and no backpack, getting wet was no big deal, but slightly unexpected. The only thing that made sense was to explore the old logging road that proceeded slightly left on the other side of the gravel road. I hiked along this until it turned around into a new valley, however, there was no sign of Deep Gap. Returning to the gravel road, I realized that time would run out and that Standing Indian would remain standing without my visit. The blue markers continued into the hill on the opposite side and I decided to hike it at least 10-15 minutes, just to explore, but with little hope of finding any clues. Sure enough, this trail just traversered a big slope and I turned back to the gravel road. By now, I had hiked for more than 2 hours and certainly needed to return the way I had come. This caused no problems and I decided that the most likely place where things could have gone wrong must have been down by the creek. After all, the trail was named Kimsey Creek Trail, it made sense that it might just follow the creek for a somewhat longer distance. I checked this out on my return and sure enough, if one ignored the double blue marker, then ignored the only clearly marked continuation of the trail, yes then one would indeed pick up another path with blue markers further along and near the creek. Admittedly, one tends to get a bit "spoiled" in the USA, when hiking along signed trails that also carry clear (blue paint) markings. Things are (normally) so well organized that one simply "cannot go wrong". This in turn, makes for starting out on hikes like this without the proper equipment (like a map or at least the GPS coordinates of the destination). If I had known that the closed road indeed was as short as I discovered after the hike (see below), then I would just have hiked along it. That the gravel road that I came across, indeed was the very road coming from the closed roadfork and heading to Deep Gap, just adds insult to injury. Had I known this, I could still have completed the trip by just turning left and continued my hike along the road. I was back at the car at 1615, 3.5 hours of fast hiking in the hills had certainly given me a fair amount of exercise. I was motivated for looking carefully at my map in order to find a good route driving to Atlanta. While doing this, I discovered that the highest point in the state of South Carolina was located quite nearby and more or less on a sensible route to Atlanta. I decided to see if it could be visited while the daylight still lasted, thus providing a small reward (for all my effort) at the very end of the day. See this map for a complete picture of what happened.